Protect our Bosque from the Proposed Rio Grande Vision Plan /Hawks Aloft Inc. There will be a second public meeting on Wednesday Sept. 18, 6 -8 pm. We encourage you to familiarize yourself with the plan, attend the meetings and express your opinions, either through the public meeting venue or by submitting written comments to via email to theplan@cabq.gov Comments may also be mailed to The Mayor’s Office, PO Box 1293, Albuquerque NM 87103. As an organization that cares deeply about the health of our bosque, we mailed a letter to the Mayor on September 3, 2013, the same date as the revised Plan was posted on the City website. We urged Mayor Berry and his team to consider the effects of a similar management that has occurred in the Rio Rancho bosque over the past 10 years and the devastating impacts to bird densities as that reach of the bosque has become more ubanized. A full copy of our letter to the Mayor follows below this chart. Hawks Aloft, Inc. is deeply concerned that the City of Albuquerque’s Rio Grande Vision Plan, if enacted, will have a devastating effect on avifauna and other wildlife that depend on the natural habitat of the bosque. We base our concerns on scientific data collected by Hawks Aloft, Inc. We have conducted avian monitoring within the bosque, between Bernalillo and the La Joya Game Management Area since December 2003. The purpose of our study is to assess avian abundance and species richness (number of different species observed) relative to habitat and management entities. We currently monitor 78 (½ mile long) transects in various habitats. Each route is surveyed three times per month during the summer and winter months, when the birds present are resident, rather than migratory. As greater detail has been released about the Rio Grande Vision Plan, it is apparent that large portions of the bosque within the Rio Grande Valley State Park will be developed to increase human usage, with hardened riverside trails up to as 8-10’ wide, viewing blinds, benches, and other park-like amenities, many of which are proposed for installation along the river’s edge. The Plan also calls for removal of non-native vegetation as part of a restoration process. All of these sound very similar to the Willow Creek bosque management that has occurred in our neighbor to the north, Rio Rancho. The Rio Rancho bosque has undergone significant changes, from an unmanaged wild area in 2003 to urban parkland between 2004 and 2012. (Changes have occurred in 2013, but data are still being analyzed). We have documented a significant decline in avian abundance over time as this section of bosque has become increasingly developed. 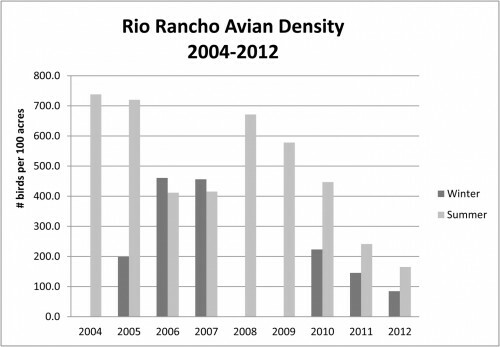 We provide the history below as potential explanation for the change in bird densities in the Rio Rancho bosque. 2004-2005: Mechanical clearing of non-native woody vegetation occurred in some areas. Sunflower crop was poor, resulting in relatively low bird numbers during winter. Limited human use. 2006-2007: Vegetation re-growth and presence of extensive sunflower patches. The sunflowers attracted large numbers of wintering birds, especially sparrows and finches. 2008-2009: Crusher-fine loop trail installed. Human use began increasing as soon as trail was completed. No winter surveys conducted due to lack of funds. 2009-2010: Clearing resumed, again using heavy equipment, resulting in removal of all woody vegetation except for coyote willow, cottonwoods, and a few, scattered New Mexico olives. Expanded wide, crusher-fine, walking trails, and smaller trails with classroom style seating. Sunflowers were mowed prior to setting seed. 2011-2012: Avian density among the lowest of all transects surveyed. 2013: Additional crusher-fine trails and benches installed. Riverbed altered to shift water flow closer to the Rio Rancho bosque and provide benefit to silvery minnow. Fill from riverbed mounded on west edge. Fill area seeded; minimal planting of shrubs. Human and dog use of the Willow Creek bosque has grown exponentially since the establishment of the wide, crusher-fine trail. It is not unusual to encounter 20-30 people and up to 10 dogs, many of them off-leash, during a ½ mile long transect. This bosque has become a place for people and a de facto dog park, with little natural habitat for wildlife. Birds that utilize the shrub understory and ground dwelling species have largely disappeared due to the lack of cover and persecution by unleashed dogs. Those birds present are largely canopy dwelling species such as White-breasted Nuthatch, Downy Woodpecker, House Finch, and Black-chinned Hummingbird. All Russian olive (non-native) and junipers (native) have been removed from the Willow Creek bosque. Russian olive is of vital importance to birds in the middle Rio Grande bosque. It is, in general, greatly undervalued by land managers, but provides important nesting substrate for sub-canopy and understory breeding birds as well as an important food and cover resource. While dense stands of coyote willow provide valuable cover for birds, they do not provide a substantial food resource, particularly for seed and berry eating animals; additionally, because coyote willow lacks a complex structure, it is of limited value to nesting birds. We believe that the Rio Grande Vision Plan, if enacted in its current state, will have a similar, equally devastating effect on bird numbers, as that documented in the Rio Rancho bosque. We sincerely hope that we are able to have a voice at future technical science team meetings. It seems rather odd that the research group that has monitored bird use in the bosque for the past 10 years has not been included in the planning process. Thank you for your attention to our concerns.